Florida Powerboat Club president Stu Jones took his Project 1080 Cigarette on its first poker run last week from Miami to Duck Key. 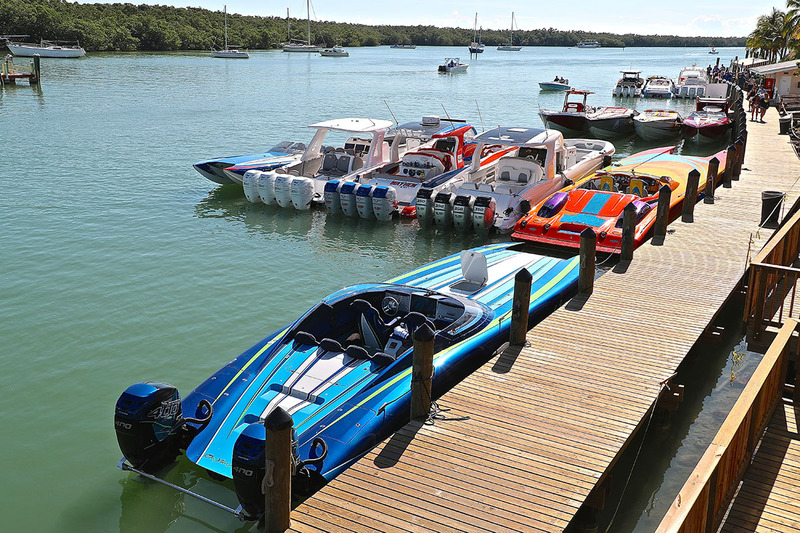 For Stu Jones, president of the Florida Powerboat Club, the 2019 season-opening Winter Poker Run from Miami to Hawks Cay Resort & Marina in Duck Key was as memorable as any of the club’s 26 previous kick-off events. That’s because he got to debut the “Project 1080” Cigarette Racing Team 38-foot V-bottom that was repowered with twin Mercury Racing 540 engines, amongst other things, in a rather intimate poker run setting with 20 club members who brought an impressive array of performance boats on the run last Friday. “My boat ran great—we have some dialing in to do still and plan to test some different props, but overall the engines felt great and provided plenty of power,” Jones said on Tuesday en route to Destin, Fla., for meetings regarding the club’s mid-August Emerald Coast Powerboat Poker Run and the more pressing late-May Orange Beach Powerboat Week, the club’s first event in Alabama and a new partnership with The Wharf at Orange Beach. 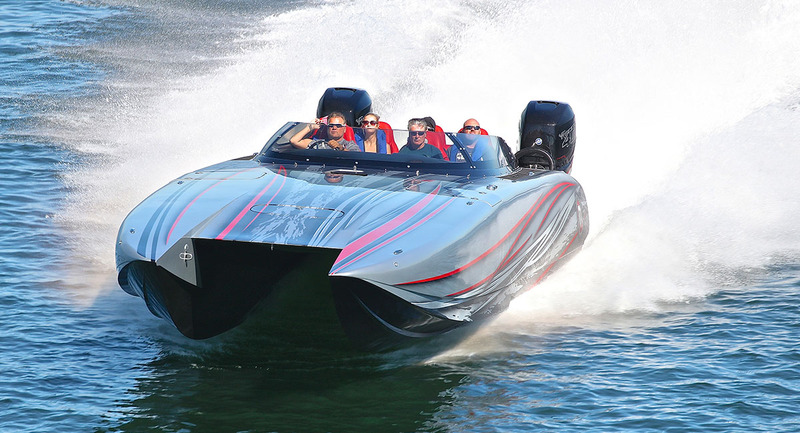 “Fortunately with Performance Marine Trading owner Pat Sullivan handling things, we’re in capable hands. FJ Propeller also is on board as a sponsor so that will help us with getting different props to test. Jones and his sons, Maxwell (13, left) and Tyler (14), had a great time showing off Project 1080 during the Winter Poker Run. Jones said at the Winter Poker Run he raised several thousand dollars for Broward House, a not for profit social services organization that provides services for people impacted by HIV and other chronic health challenges, by providing rides to two different couples. He plans to do the same thing at events throughout the season to raise money for the various causes they support. Not only was he ecstatic about getting Project 1080—a 2000 model-year Cigarette that was repainted by Dark Force Marine in Pompano Beach and reupholstered by Cigarette and the talented team at Fineline Marine Interiors in Hallandale Beach—on the water, Jones was pleased with the overall turnout for the run. “We were right where I expected with 22 boats registered,” he said. “That was a good number for this run and for the facility. The conditions were great for boating, especially heading to the Keys for the first leg on Friday. I was most impressed by the mix of boats we had on hand. I’d say close to half of the boats were center consoles. We had a couple of Nor-Techs, a couple of Mystics, a 44-foot Concept and even a new 36-foot Glasstream. Ron Szolack ran his brand new Mystic C3800 in the Winter Poker Run with Mystic founder John Cosker. Jones said the landmark host resort has been undergoing post-hurricane renovations and that while most things were in great condition, the dock situation was not quite up to par. The boats in the FPC season opener stopped for lunch at Gilbert’s in Key Largo. 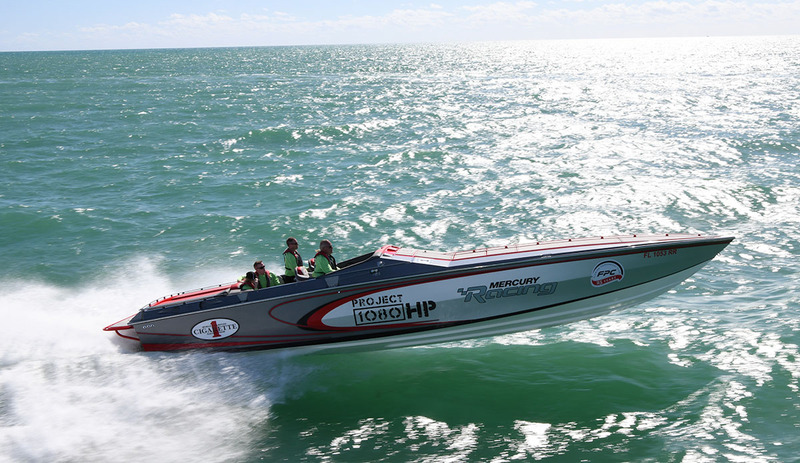 While Jones is currently working on events that are in May and August, he and the FPC are also busy planning the Miami Boat Show Poker Run and a showcase event he has planned for Project 1080, the Friday before the Miami International Boat Show begins. He said the details aren’t officially complete but that there is a Project 1080 kick-off reception for media, sponsors, etc., that is going to feature a christening of the Cigarette, set for Friday, Feb. 8 at Haulover Marine Center in North Miami.